Powerbox, one of Europe’s largest power supply companies and a leading force for four decades in optimizing power solutions for demanding applications, has announced a new range of high-voltage input DC/DC converters for microgrid, datacenters and industrial applications. Part of its industrial line, the new series of HVDC/DC converters operate with an input voltage range of 180VDC to 425VDC, and deliver output power levels from 150W to 750W. The range of applications powered by high-voltage DC supplies is rapidly expending, and from the latest microgrids and datacenters using high voltage DC (HVDC) bus voltages to reduce power losses through to industrial systems, all of these applications require ready to use, board-mounted power converters. Powerbox’s PQB-PHB-PFB300S series is specially designed for such applications. They are built around a high efficiency topology, have a layout optimized for thermal conduction, an input/output isolation of 3,000 VAC minimum and deliver output voltages from 3.3VDC to 48VDC. Energy network managers and systems architects developing electronic equipment connected to microgrids are concerned about energy efficiency and utilizing direct conversion from the 350VDC bus for specific applications. In many cases the voltage conversion is achieved using single stage, modular HVDC/DC converters stepping down the bus voltage to the load. The same is now happening in the latest generation of datacenters, increasing energy utilization by the reduction of power losses by migrating from AC distribution to HVDC. High voltage DC distribution is also very common in industrial electrical vehicles such as are used in the mining and tunnel industries. These require fully encapsulated power modules able to operate within a wide temperature range, and down to -40 degrees C. Such applications are what the PRBX PQB-PHB-PFB300S HVDC/DC converters series is designed for. 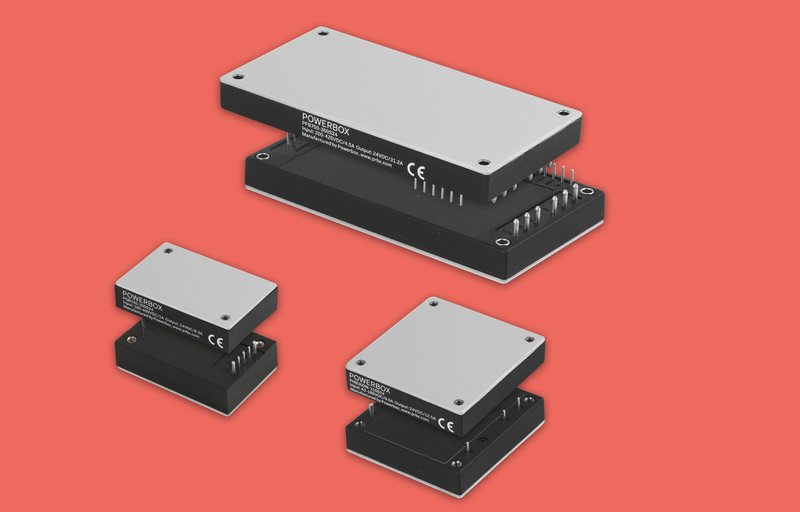 In order to provide a solution for any application powered from a high-voltage bus, the PRBX PQB-PHB-PFB300S series includes four power levels (150, 300, 600 and 750W) in three industry-standard packaging formats and footprints; quarter, half and full-brick. The 150W rated PQB150-300S is packaged in a quarter-brick format, has an input voltage of 180VDC to 425VDC and offers seven different output voltages; 3.3VDC/30A, 5.0VDC/30A, 12VDC/12.5A, 15VDC/10A, 24VDC/6.3A, 28VDC/5.4A and 48VDC/3.2A. The typical efficiency is 89%. The PHB300-300S is a half-brick, 300W rated version with an input voltage of 180VDC to 425VDC and offers five different output voltages of 5VDC/60A, 12VDC/25A, 24VDC/12.5A, 28VDC/10.7A and 48VDC/6.25A. The typical efficiency is 89%. The PFB600-300S comprises full-brick, 600W modules with an input voltage of 200VDC to 400VDC providing four different output voltages; 5VDC/80A, 12VDC/50A, 24VDC/25A, and 48VDC/12.5A. The power efficiency is typically 89% and up to 91% on the 24 and 48VDC outputs. For redundancy or additional power, the units include active current sharing. The 750W PFB750-300S full-brick modules can be operated with an input range of 200VDC to 425VDC and are available in six different output voltages; 12VDC/62.5A, 15VDC/50A, 24VDC/31.2A, 28VDC/26.7A, 36VDC/20.8A and 48VDC/15.6A. The typical efficiency is 90% and the product includes active current sharing. The PFB600-300S and PFB750-300S have an output trim range of 60-110% that facilitates using the modules as a constant current source or as a secondary battery charger. Designed for use in industrial environments, the PQB-PHB-PFB300S series can be operated within a wide temperature range of -40 to +100 degrees C and in 95% of non-condensing relative humidity. The modules’ thermal shutdown is set to protect the units when the housing reaches 105 degrees C.
All products in the PRBX PQB-PHB-PFB300S series include under-voltage, over-voltage protection and lockout, continuous short circuit protection, current limiting and over-temperature protection. Both positive and negative remote ON/OFF types are available. The output voltage can be adjusted via the trim pin and all products feature voltage sensing and compensation pins. The products are encapsulated in a plastic case with an aluminum baseplate to facilitate cooling and power dissipation. All units operate at a fixed switching frequency and including input filters (Pi or C types). As required for HVDC bus voltage applications, all products have an input to output isolation of 3,000VAC minimum. The input to case isolation is 2,500VAC and output to case is 500VAC. The isolation resistance is 107 (10 to the power of 7) ohms minimum. The PRBX PQB-PHB-PFB300S series meet the requirements of UL60950-1, EN60950-1 and IEC60950-1 standards and CE mark 2014/30/EU. Founded in 1974, with headquarters in Sweden and operations in 15 countries across four continents, Powerbox serves customers all around the globe. The company focuses on four major markets – industrial, medical, transportation/railway and defense – for which it designs and markets premium quality power conversion systems for demanding applications. Powerbox’s mission is to use its expertise to increase customers’ competitiveness by meeting all of their power needs. Every aspect of the company’s business is focused on that goal, from the design of advanced components that go into products, through to high levels of customer service. Powerbox is recognized for technical innovations that reduce energy consumption and its ability to manage full product lifecycles while minimizing environmental impact.